Mahmoud Al-Hussary is a renowned reciter of the Quran. He was born in a village called Shubra Al-Namlah in Tanta, Egypt. Mahmoud entered the Quran School at the age of four. At 8, he had already memorized the whole Quran and at 12, he entered to the religious institute and learnt the ten recitations in Al-Azhar. Mahmoud Khalil Al-Hussary first recited the Quran in his village mosque. 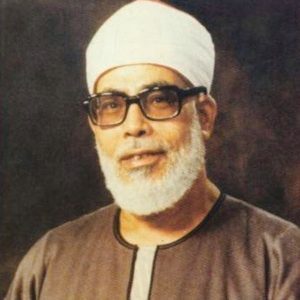 In 1944, he entered the official radio station as reciter where he made his first recitation on 16 February 1944. On August 7, 1948, he was nominated Muazzin (Prayer caller) of Sidi Hamzah Mosque and then a reciter in the same mosque. He was also supervising recitation centers of Al Gharbia Governorate. In 1949, Mahmoud Al-Hussary was appointed reciter of Sidi Ahmed Al-Badawi of Tanta , of Al-Ahmadi Mosque and then of Al Imam Al Hussein Mosque in Cairo by 1955. All along his way, Sheikh Mahmoud obtained various medals and decorations and was honored by numerous Islamic and foreign countries which he visited. He was treated with a special care by leaders, kings and presidents. He received the medal of honour concerning Sciences and Arts from the president Jamal `Abd An-Nasir in 1967 and was elected as president of the Islamic world league of Koran reciters. He had the chance to recite the Quran in front of the American congress and the United Nations. Thanks to his, Allah guided dozens of people during his journeys abroad. He remained, for the rest of his life, a researcher, a writer, a thinker and of course one of the biggest public figures in Egypt and in the Arab Muslim world. Sheikh Al-Husary is one of the wise recitors who are very experienced in the art of reciting, and one of the best interpreters of Hadith. Thus, he got Al-Azhar diploma of the tenth Quran recitations in 1958.